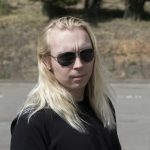 Photos of Epica and Lacuna Coil by Pollen Heath. 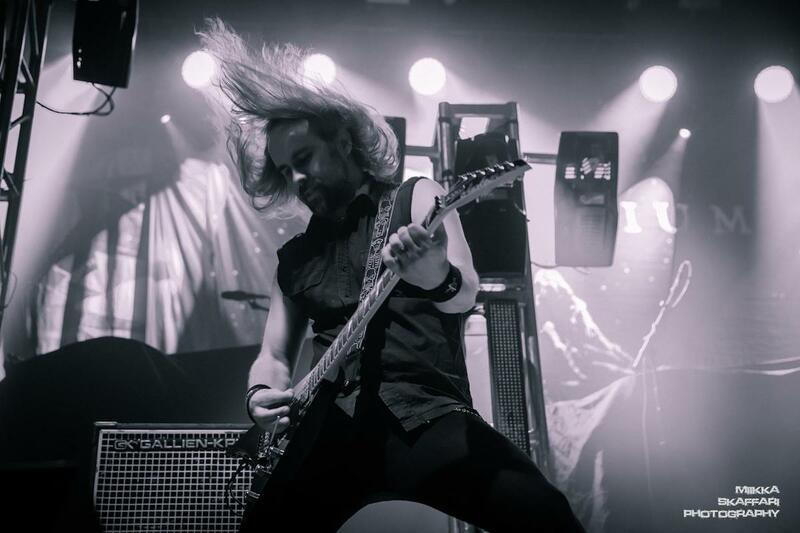 Photo of Insomnium by Miikka Skaffari. 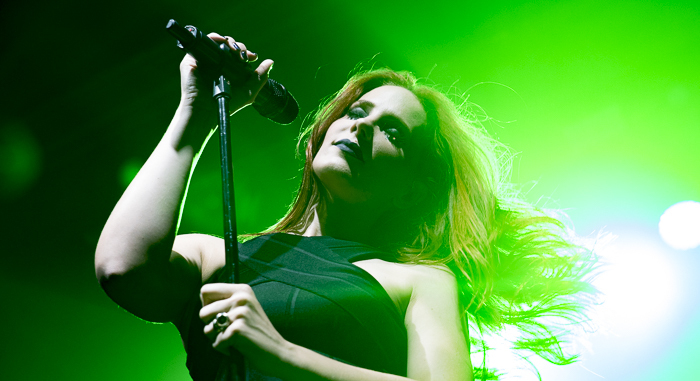 Orchestral power metal stalwarts Epica brought their powerful and high-energy stage show to the UC Theatre on Thursday night, performing a blistering set that highlighted their impressive musical chops. After the intro track “Eidola” blared over the PA system the band took the stage, opening with the furious stomp of “Edge of the Blade.” The song features all the sonic qualities that make Epica such a mainstay in the modern metal scene: fierce metal guitar riffs, booming drums, intricate keyboard lines, and the mighty vocal stylings of singer Simone Simons. The track also featured plenty of growled vocals from guitarist/vocalist Mark Jansen, providing the perfect musical counterpoint and keeping the song interesting. Backed by an array of strobe lights and elevated platforms, the band had their stage show mapped out perfectly, and it helped give a whole other dimension to what is already an epic collection of songs. Next up was the pummeling “Unleashed” from 2009’s Design Your Universe. The song relies on a potent combination of Coen Janssen’s orchestral keyboards and a rhythmic assault from drummer Ariën van Weesenbeek and bassist Rob van der Loo, who give the song plenty of power. Eventually, the song descends into a subdued breakdown featuring an evocative set of vocals from Simons before picking up steam once again. The sheer musical dexterity of the band is something to marvel at, as each song has so many different and complex musical parts that fit together incredibly well. Epica upped the intensity level on the next song, the overwhelming “Wheel of Destiny” from their latest EP The Solace System. The song begins with an aggressive bit of guitar riffing from Jansen and Isaac Delahaye, going into a full-bore speed fest before settling into a stomping mid-tempo groove. Throw in another strong performance from Simons, who used a lower pitched vocal delivery than normal, and you have one massive song. 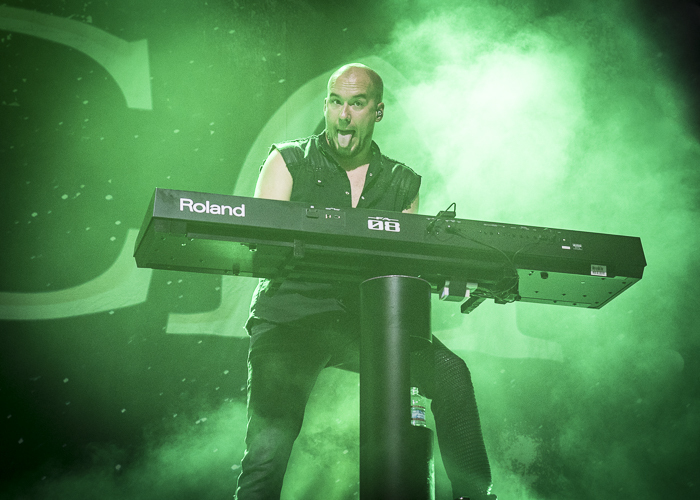 A few songs later Janssen brought out an oddly shaped keyboard strapped to the front of his chest as he made his way to the front of the stage to play in the orchestral intro to the song “Dancing in a Hurricane.” The track starts off with a sound akin to a film score as Simons entered with another strong vocal line. Eventually, the rest of the band joined, and the track lifted off into another furious metal anthem. Epica closed out the main portion of their set with an inspired version of one of their oldest tracks, the sweeping grandeur of “Cry for the Moon.” The song’s mid-tempo attack is punctuated by the contrasting vocals of Jensen and Simons, leading into a particularly strong chorus and a furious coda to the track. 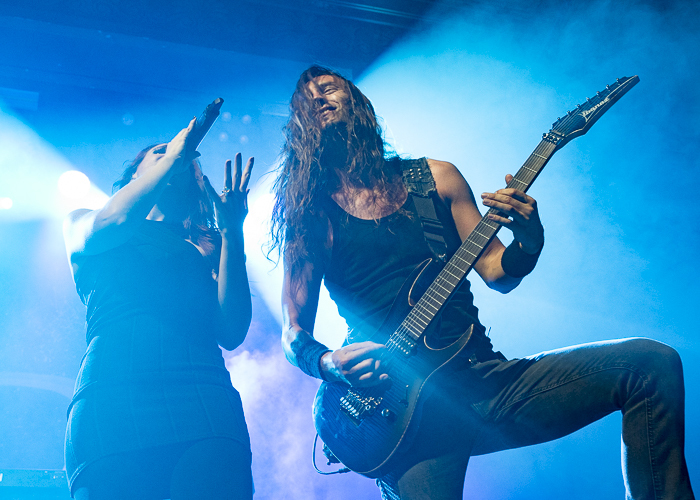 After a brief intermission, the band returned for a three-song encore that started off with the fan favorite “Sancta Terram” another blistering shot of symphonic metal that saw Janssen leap into the audience and crowd surf as he was playing his instrument. Finally, Epica ended the evening with a spirited version of “Consign to Oblivion” which featured a massive wall of death (essentially half of the audience running full steam into the other half) erupt at the beginning of the song’s fast-paced verse section. 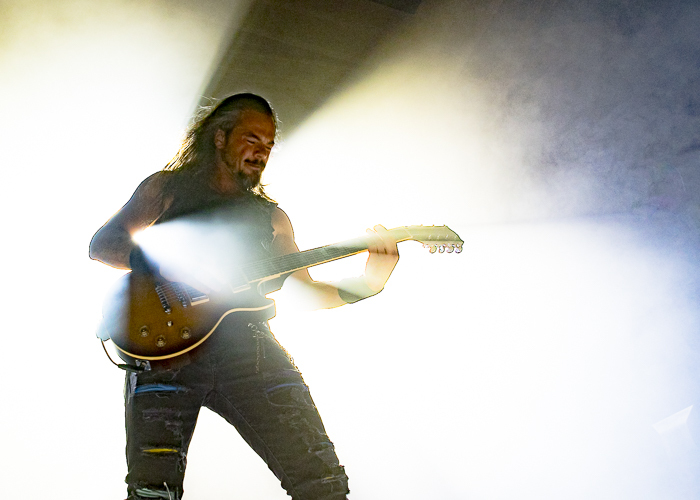 It was a fitting conclusion to a fantastic night of epic metal from the band, who once again showed that they are one of the best live metal acts out there today. 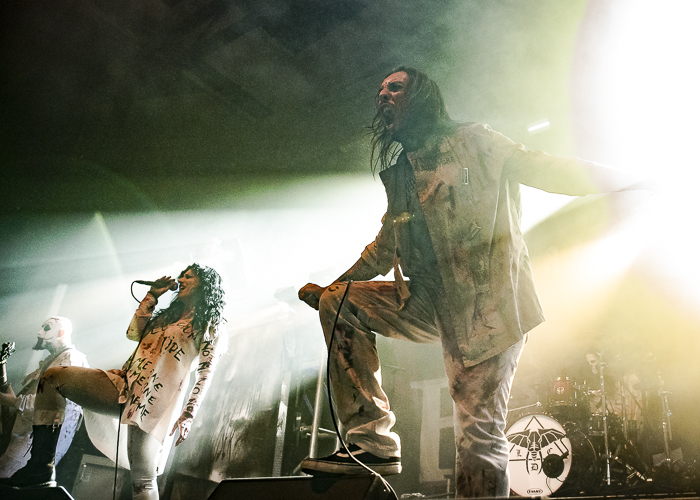 Lacuna Coil provided direct support with a furious set of groove inflicted gothic metal. 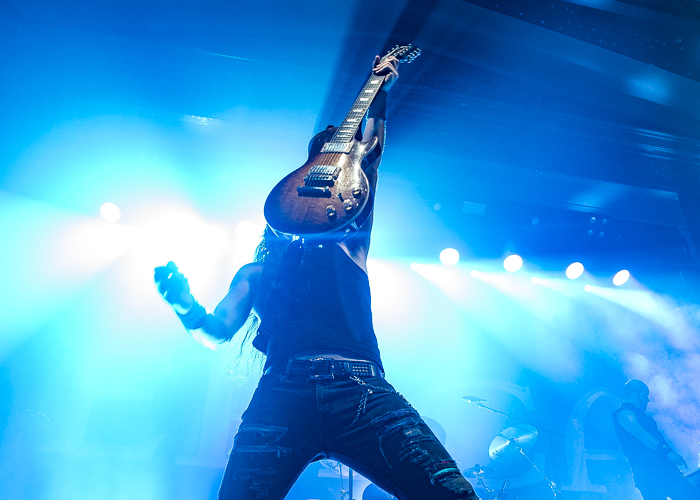 New guitarist Diego Cavallotti made himself known from the opening seconds of the smashing “Ultima Ratio” with his bludgeoning guitar riffs taking center stage alongside a particularly complex guitar solo. 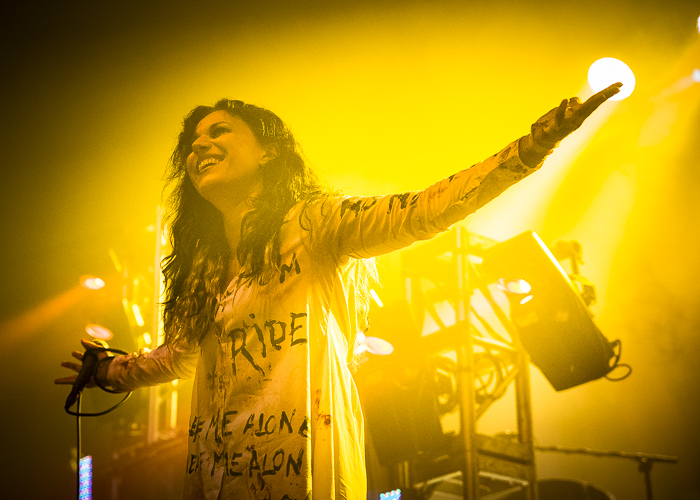 As has been the case since the band’s inception, vocalists Andrea Ferro and Cristina Scabbia were in great form in alternating between Ferro’s guttural approach and Scabbia’s high-flying falsetto. 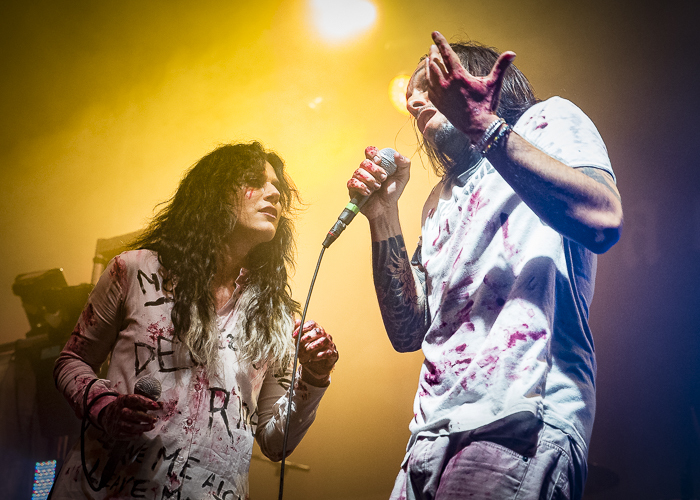 While most of the setlist was culled from the band’s newest release, Delirium, they still had plenty of room to include a few of their most well-known tracks, such as the anthemic “Heaven’s a Lie” which rode a swinging groove from bassist Marco Coti Zelati and drummer Ryan Blake Folden. Insomnium opened the night up with a bang, delivering a fast-paced set of melodic death metal that included hefty amounts of material from their latest release, Winter’s Gate. The group opened their set with the soaring “The Primeval Dark,” a piece that shifts in tempo and feel multiple times to achieve a great sense of dynamics and power. A few songs later Insomnium tore through the first three parts of the “Winter’s Gate” song cycle, featuring plenty of clean vocals, epic harmonies and abrasive growled vocal stylings. It was the ideal way to get fans warmed up for the whole evening of blistering metal. 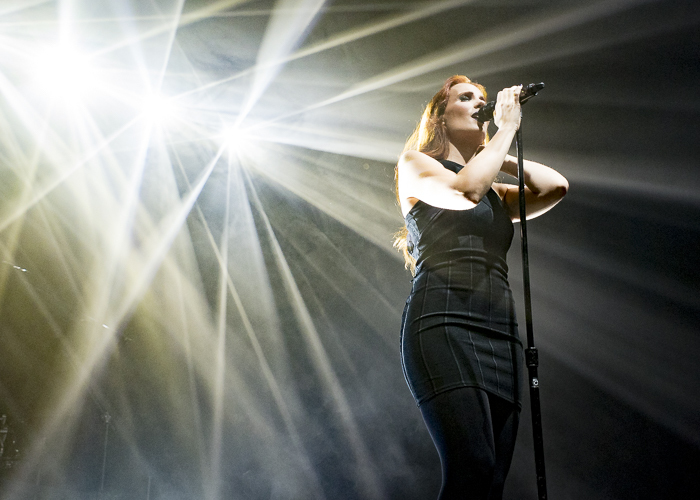 Find out more about Epica on their website. Check out Lacuna Coil here. Get all the dirt on Insomnium here.